This collection of stories is packed full of Christmas tales and legends from around the world; a festive treat from a popular storyteller. Here you will find Nativity stories from the Bible, folk tales from long ago, stories of favourite Christmas figures, and learn about how many Christmas traditions came about. Written to be read aloud or read alone, the stories jump off the page with fun illustrations which capture the Christmas spirit and will become family favourites, year after year. 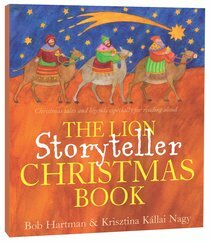 About "The Lion Storyteller Christmas Book"
Krisztina Kallai Nagy was born in Hungary and trained as a graphic designer before starting her own design and illustration business. She particularly enjoys illustrating Bible stories and lives in Budapest with her husband, Janos and young daughter, Bori.